Dr. A. N. (Nickie) Baird was one of ten PVM faculty members honored at the College’s annual Promotions Reception May 16. This week’s Vet Gazette Faculty Spotlight focuses on Dr. A.N. (Nickie) Baird, who has been promoted to full professor of large animal surgery in the Department of Veterinary Clinical Sciences. Dr. Baird also has served as the Veterinary Teaching Hospital’s Large Animal Surgery section chief and the Large Animal Hospital chief of staff. Dr. Baird earned his DVM degree at Auburn University in 1984. He then completed both an internship and surgery residency at the Texas A&M College of Veterinary Medicine & Biomedical Sciences, where he also received his MS degree in 1989. He then joined the Texas A&M faculty before accepting a faculty appointment at Auburn. In 1994, he became a Diplomate of the American College of Veterinary Surgeons. 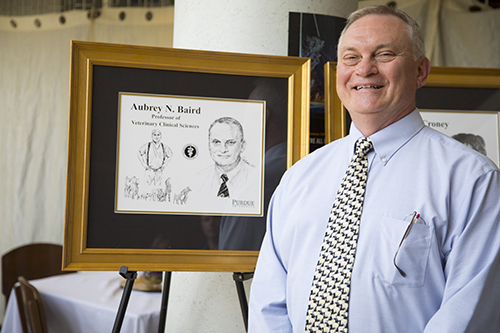 After eight years on the Auburn faculty, Dr. Baird went to the University of Pennsylvania School of Veterinary Medicine where he served on the faculty for three years before coming to the Purdue University College of Veterinary Medicine in 2001. Outside the walls of Lynn Hall, Dr. Baird frequently enjoys the great outdoors. He also loves to support his children in both their outdoor and athletic activities. Dr. Baird explained, those activities include “…a lot of volleyball, rabbit raising, and falconry!” To those who are looking to pursue a career in veterinary medicine, Dr. Baird said, “Do this profession if you love it, but always keep faith, family and career in the proper order.” Congratulations to Dr. Nickie Baird, one of the ten 2017 promoted PVM faculty!